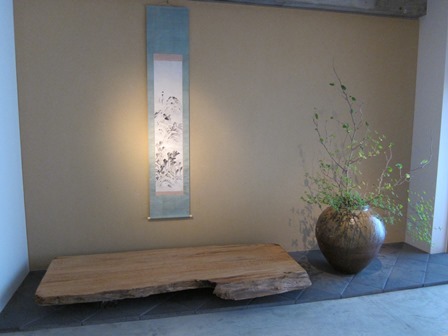 We are pleased to announce a new exhibition in our Shirokane gallery, focusing on the theme of Nanga. Also commonly referred to as literati painting, this style was imported from China in the 17th century and flourished throughout the rest of the Edo period and beyond. The term Nanga (南画　lit. "southern painting") derives from the Chinese Southern school of painting (南宗画) that Japanese literati of the time sought to emulate. On display are works by Uragami Gyokudō (1745-1820), the musician and painter from Okayama whose free-spirited approach to life is evident in his brushwork, and also Gion Nankai (1677-1751), one of the first to explore the newly imported style. 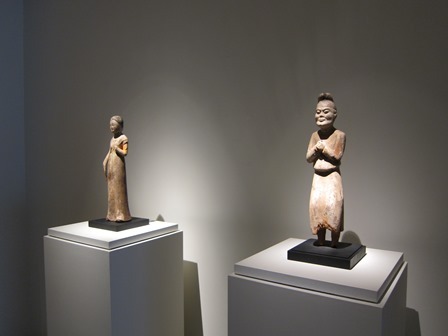 Welcoming visitors are two wooden Chinese figures, a nod to the ancient culture in which Nanga has its roots. We hope you will stop by to see the show.